Christ's halo inscribed: "YHS / XPS / FIL[IUS]"; scrolls inscribed: "Timete dominum et date illi hono[rem] / Dignus est agnus qui o[ccisus est]"; hem of Virgin's robe inscribed: "Ave Maria g[ratia] plen[a] dominus tecum be[nedicta]"
Gently, Christ places the ornate gold crown upon the Virgin Mary's slightly bowed head. Groups of musical angels watch from either side as she becomes the Queen of Heaven. 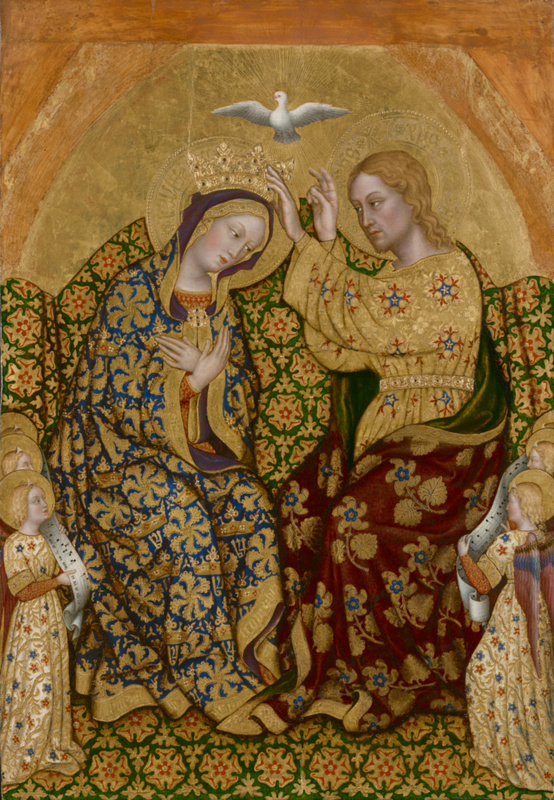 Gentile da Fabriano used extensive tooling, decorative patterning, gold leaf, and rich pigments to create a sumptuous surface resembling tapestry. The complex patterning, elaborate materials, and long flowing lines of the robes of the Madonna and Christ characterize the International Gothic style. Gentile was commissioned to paint this scene for his native town, Fabriano, when he was at the height of his fame. The gold-encrusted panel functioned as a processional standard held aloft in parades that honored the Virgin Mary. The panel originally depicted The Stigmatization of Saint Francis on the reverse. Sometime prior to 1827, the panel was sawed into two sections; the Saint Francis panel is now in a private collection in Italy. Church of San Francesco (Fabriano, Italy), commissioned from the artist, about 1420; transferred to the Congregation of the Fathers of the Oratory of San Filippo Neri. Congregation of the Fathers of the Oratory of San Filippo Neri (Fabriano, Italy), transferred to the seminary in Fabriano, by 1827. Source: 1827 manuscript by Vincenzo Liberati, cited in Bruno Molajoli, Gentile da Fabriano (Fabriano: Edizione "Gentile," 1927), p. 112n2. Nocchi (Florence, Italy), sold to John Sanford, 1835. Source: Account book/diary of Rev. Sanford, Barber Institute, Birmingham, cited in Keith Christiansen, "The Coronation of the Virgin by Gentile da Fabriano." The J. Paul Getty Museum Journal 6-7 (1978-79), p. 10, app. 1. Rev. John Sanford, 1775 - 1855 (London; England; Nynehead Court, Somerset, England; Florence, Italy), by inheritance to his son-in-law, Frederick Henry Paul Methuen, 1855. Frederick Henry Paul Methuen, second baron Methuen, 1818 - 1891 (Corsham Court, Wiltshire, England), by inheritance to Paul Sanford Methuen, 1891. Charles Sedelmeyer, 1837 - 1925 (Paris, France), sold to Henri Heugel, 1902. Henri Heugel (Paris, France), by inheritance within the Heugel family. Heugel Family (Paris, France), sold to Thomas Agnew & Sons, Ltd., 1976. Thomas Agnew & Sons, Ltd. (London, England), sold to the J. Paul Getty Museum, 1977. Catalogue of Pictures by Italian, Spanish, Flemish, Dutch, and French Masters [...], exh. cat. (London: British Institution, 1839), p. 14, no. 162. Catalogue Raisonné of Pictures, etc. The Property of the Rev. John Sanford (London: n.p., 1847), pp. 24-25, no. 28. Waagen, Gustav Friedrich. Galleries and Cabinets of Art in Great Britain: Being an Account of More than Forty Collections of Paintings, Drawings, Sculptures, Mss. [...] Visited in 1854 and 1856, and Now for the First Time Described, A Supplement to Treasures of Art in Great Britain (London: John Murray, 1857), p. 397. Venturi, Adolfo, ed.Le vite de' più eccellenti pittori, scultori e architettori, scritte da M. Giorgio Vasari, pittore et architetto aretino. I. Gentile de Fabriano e il Pisanello (Florence: G. C. Sansoni, 1896), p. 24, no. 12. Christie, Manson & Woods, London. Catalogue of [...] Fine Old Italian Pictures, from the Collection of the Right Hon. Lord Methuen, from Corsham Court [...]. May 13, 1899, p. 21, lot 81. Illustrated Catalogue of the Sixth Series of 100 Paintings by Old Masters of the Dutch, Flemish, Italian, French, and English Schools, Being a Portion of the Sedelmeyer Gallery [...] (Paris: Chas. Sedelmeyer, 1900), pp. 72-73, no. 57, ill.
Colasanti, Arduino. Gentile da Fabriano (Bergamo: Istituto Italiano d'Arti Grafiche, 1909), pp. 53-54, ill.
Berenson, Bernard. The Central Italian Painters of the Renaissance. 2nd ed. (New York and London: G. P. Putnam's Sons, 1911), p. 175. Venturi, Adolfo. Storia dell'arte italiana. Vol. 7, La pittura del Quattrocento, part 1 (Milan: Ulrico Hoepli, 1911), pp. 192-93. Crowe, Joseph Archer, and Giovanni Battista Cavalcaselle. A History of Painting in Italy [...]. Vol. 5, Umbrian and Sienese Masters of the Fifteenth Century. Tancred Borenius, ed. (New York: Charles Scribner's Sons, 1914), p. 209. Eigenberger, Robert. Die Gemäldegalerie der Akademie der bildenden Künste in Wien (Vienna and Leipzig: Manz Verlag, 1927), p. 157, under no. 1097. Molajoli, Bruno. Gentile da Fabriano (Fabriano: Edizioni "Gentile," 1927), pp. 112n2, 117-18n14, pl. XVbis. Marle, Raimond van. The Development of the Italian Schools of Painting. 19 vols. (The Hague: Martinus Nijhoff, 1923-1938), vol. 8 (1927), pp. 26, 27, fig. 18 (conflates Getty painting with Vienna copy). Longhi, Roberto. "'Me pinxit': Un San Michele Arcangelo di Gentile da Fabriano." Pinacotheca 1, no. 2 (September-October 1928), pp. 74, 75. Berenson, Bernard. Italian Pictures of the Renaissance: A List of the Principal Artists and Their Works with an Index of Places. 2 vols. (Oxford: Clarendon Press, 1932), p. 221. Colasanti, Arduino. Italian Painting of the Quatrrocento in the Marches. Ronald Boothroyd, trans. (Florence: Pantheon; Paris: Pegasus, 1932), pp. 16, 146, pl. 11. Grassi, Luigi. Tutta la pittura di Gentile da Fabriano (Milan: Rizzoli, 1953), pp. 60-61, pl. 69. Nicolson, Benedict. "The Sanford Collection." The Burlington Magazine 97, no. 628 (July 1955), pp. 209, 210. Berenson, Bernard. Italian Pictures of the Renaissance: A List of the Principal Artists and Their Works with an Index of Places; Central Italian and North Italian Schools. 3 vols. (New York: Phaidon, 1968), vol. 2, pl. 531. Berenson, Bernard. Italian Pictures of the Renaissance: A List of the Principal Artists and Their Works with an Index of Places, Central Italian and North Italian Schools. 3 vols. (New York: Phaidon, 1968), vol. 1, p. 164. Molajoli, Bruno. Guida artistica di Fabriano (Fabriano: Rotary Club, 1968), p. 32. Longhi, Roberto. "'Me pinxit': un 'San Michele Arcangelo' di Gentile da Fabriano." In Edizione delle opere complete di Roberto Longhi. Vol. 4, 'Me pinxit' e quesiti caravaggeschi, 1928-1934 (Florence: Sansoni, 1968), p. 50. Zampetti, Pietro. La pittura marchigiana da Gentile a Raffaelo (Milan: Electa, n.d.), p. 34. Zampetti, Pietro. Paintings from the Marches: Gentile to Raphael (London: Phaidon, 1971), p. 32. Micheletti, Emma. L'opera completa di Gentile da Fabriano (Milan: Rizzoli, 1976), pp. 87-88, no. 22, ill.
Christiansen, Keith. "The 'Coronation of the Virgin' by Gentile da Fabriano." The J. Paul Getty Museum Journal 6-7 (1978-79), pp. 1-12, figs. 1-3, 10. Fredericksen, Burton B., Jiří Frel, and Gillian Wilson. Guidebook: The J. Paul Getty Museum. 4th ed. Sandra Morgan, ed. (Malibu: J. Paul Getty Museum, 1978), pp. 76-77, ill.
Fredericksen, Burton B. Masterpieces of Painting in the J. Paul Getty Museum (Malibu: J. Paul Getty Museum, 1980), unpaginated, no. 2, ill.
Fredericksen, Burton B., Jiří Frel, and Gillian Wilson. The J. Paul Getty Museum Guidebook. 5th ed. (Malibu: J. Paul Getty Museum, 1980), pp. 64-65, ill.
A Dealer's Record: Agnew's 1967-81 (London: Barrie & Jenkins, 1981), p. 12. Christiansen, Keith. "Gentile's 'Coronation of the Virgin.'" In A Dealer's Record: Agnew's 1967-81 (London: Barrie & Jenkins, 1981), pp. 14-19, fig. 1. Christiansen, Keith. Gentile da Fabriano (Ithaca, NY: Cornell University Press, 1982), pp. 18-19, 21, 93-96, no. VIII, pl. 20; p. 115, under no. XXII. Gardner, Julian. Review of Gentile da Fabriano, by Keith Christiansen. The Burlington Magazine125, no. 963 (June 1983), pp. 364, 365. Russell, Francis. Review of Gentile da Fabriano, by Keith Christiansen. Apollo117, no. 251 (January 1983), p. 66. Sgarbi, Vittorio. Fondazione Magnani-Rocca: Capolavori della pittura antica (Milan: Arnoldo Mondadori, 1984), pp. 37-40, ill.
Wilson, William. The Los Angeles Times Book of California Museums (New York: Harry N. Abrams, 1984), pp. 173, 174, pl. 151. Vertova, Luisa. "Italian Collectors: Luigi Magnani." Apollo 121, no. 277 (March 1985), pp. 158, 159. Auld, Sylvia. "Kuficising Inscriptions in the Work of Gentile da Fabriano." Oriental Art, n.s., 32, no. 3 (Autumn 1986), p. 264, app., no. 7. Zeri, Federico. ed. La pittura in Italia: Il Quattrocento. 2nd ed. 2 vols. (Milan: Electa, 1987), vol. 2, p. 634, entry by Cristina Frulli. Fredericksen, Burton B. Masterpieces of Painting in the J. Paul Getty Museum. Rev. ed. (Malibu: J. Paul Getty Museum, 1988), unpaginated, no. 2, ill.
Zampetti, Pietro. Pittura nelle Marche. Vol. 1, Dalle origini al primo Rinascimento (Florence: Nardini, 1988), p. 281. Simonetti, Mirella. "Tecniche della pittura veneta." In La pittura nel Veneto: Il Quattrocento. Mauro Lucco, ed. 2 vols. (Milan: Electa, 1989), vol. 1, p. 258. Frulli, Cristina. "Gentile da Fabriano." In La pittura nel Veneto. Il Quattrocento. Mauro Lucco, ed. Vol. 1 (Milan: Electa, 1989), vol. 1, p. 345. Carr, Dawson W., and Mark Leonard. Looking at Paintings: A Guide to Technical Terms (Malibu: J. Paul Getty Museum, with British Museum Press, 1992), pp. 70-71, ill.
De Marchi, Andrea. Gentile da Fabriano: Un viaggio nella pittura italiana alla fine del gotico (Milan: Federico Motta, 1992), pp. 56, 105, 112, 119, 120, 128, 129n4, 130n7, 172, 187n42, pl. 33. Zampetti, Pietro, and Giampiero Donnini. Gentile e i pittori di Fabriano (Fabriano: Cassa di Risparmio di Fabriano e Cupramontana, 1992), pp. 99, 107n46, 126, fig. 28. Durham, Michael S. Miracles of Mary: Apparitions, Legends, and Miraculous Works of the Blessed Virgin Mary (New York: Blackberry Press, 1995), p. 108, ill.
Fredericksen, Burton B., et al. Masterpieces of Painting in the J. Paul Getty Museum. 3rd ed. (Malibu: J. Paul Getty Museum, 1995), unpaginated, no. 2, ill., entry by Burton B. Fredericksen. Humfrey, Peter. Painting in Renaissance Venice (New Haven and London: Yale University Press, 1995), pp. 40-42, 44, 269n5, fig. 29. Wohl, Hellmut. "Gentile (di Niccolò di Massio) da Fabriano." In The Dictionary of Art. Jane Turner, ed. (New York: Grove, 1996), vol. 12, p. 299. Fredericksen, Burton B., et al. Masterpieces of the J. Paul Getty Museum: Paintings (Los Angeles: J. Paul Getty Museum, 1997), pp. 12-13, no. 3, ill., entry by Burton B. Fredericksen. Cleri, Bonita. Antonio da Fabriano, eccentrico protagonista nel panorama artistico del Quattrocento marchigiano (Milan: Silvana, 1997), pp. 50, 52, ill.
Marcelli, Fabio. "Botteghe di artisti a Fabriano." In Bonita Cleri, Antonio da Fabriano, eccentrico protagonista nel panorama artistico del Quattrocento marchigiano (Milan: Silvana, 1997), pp. 20, 183n30, 184n38. Dal Poggetto, Paolo, ed. Fioritura tardogotica nelle Marche, exh. cat. (Urbino: Palazzo Ducale, with Electa, 1998), pp. 194-95, no. 67, ill., entry by Andrea De Marchi; p. 196, under no. 68, entry by Andrea De Marchi; p. 198, under no. 69, entry by Bonita Cleri; cover ill.
Fioritura tardogotica nelle Marche, exh. brochure (Urbino: Palazzo Ducale, 1998), unpaginated, cover ill.
Dal Poggetto, Paolo. "Storia e contenuti della mostra." In Fioritura tardogotica nelle Marche, exh. cat. (Urbino: Palazzo Ducale, with Electa, 1998), p. 15. Peri, Paolo. "Il tessuto in Italia nel periodo del gotico internazionale." In Fioritura tardogotica nelle Marche, exh. cat. (Urbino: Palazzo Ducale, with Electa, 1998), p. 50. Kirsh, Andrea, and Rustin S. Levenson. Seeing Through Paintings: Physical Examination in Art Historical Studies (New Haven: Yale University Press, 2000), pp. 88-89, 113, 116-17, figs. 89, 107. Anderson, Jaynie. I Taccuini manoscritti di Giovanni Morelli. Antonella Nasini, trans. (Milan: Federico Motta, 2000), p. 150n48. The J. Paul Getty Museum Handbook of the Collections. 6th ed. (Los Angeles: J. Paul Getty Museum, 2001), p. 94, ill.
Zuffi, Stefano. Gospel Figures in Art. Thomas Michael Hartmann, trans. (Los Angeles: J. Paul Getty Museum, 2003), p. 372, ill.
Allen, Denise, et al. Masterpieces of Painting in the J. Paul Getty Museum. Rev. ed. (Los Angeles: J. Paul Getty Museum, with Thames & Hudson, 2003), pp. 14-15, no. 4, ill., entry by Burton B. Fredericksen. Boskovits, Miklós, et al. Italian Paintings of the Fifteenth Century (Washington: National Gallery of Art, with Oxford University Press, 2003), p. 291n16. Costanzi, Costanza, ed. Le Marche disperse: Repertorio di opere d'arte dalle Marche al mondo (Milan: Silvana Editoriale, 2005), pp. 120, 281, no. 49, pl. 18, entry by Romina Vitali. Marcelli, Fabio. Gentile da Fabriano (Milan: Silvana, 2005), pp. 103-4, 106-9, 111, figs. 71, 73-76. Laureati, Laura, and Lorenza Mochi Onori, eds. Gentile da Fabriano and the Other Renaissance, exh. cat. (Fabriano: Spedale di Santa Maria del Buon Gesù, with Electa, 2006), pp. 182-84, under no. IV.1, entry by Emanuela Daffra; p. 228, under no. V.4, entry by Ilaria Fiumi. De Marchi, Andrea, Laura Laureati, and Lorenza Mochi Onori, eds. Gentile da Fabriano: Studi e ricerche (Milan: Electa, 2006), p. 160, ill.
Strehlke, Carl Brandon. "Lorenzo Monaco and Gentile da Fabriano." The Burlington Magazine 148, no. 1243 (October 2006), p. 683. Christiansen, Keith. "The Art of Gentile da Fabriano." In Gentile da Fabriano and the Other Renaissance, exh. cat. Laura Laureati and Lorenza Mochi Onori, eds. (Fabriano: Spedale di Santa Maria del Buon Gesù, 2006), pp. 30, 50n48. De Marchi, Andrea. "Gentile Returns to Fabriano: The Stigmatization of St. Francis." In Gentile da Fabriano and the Other Renaissance, exh. cat. Laura Laureati and Lorenza Mochi Onori, eds. (Fabriano: Spedale di Santa Maria del Buon Gesù, 2006), pp. 180-81. The J. Paul Getty Museum Handbook of the Collections. 7th ed. (Los Angeles: J. Paul Getty Museum, 2007), p. 88, ill.
Doherty, Tiarna, and Anne T. Woollett. Looking at Paintings: A Guide to Technical Terms. Rev. ed. (Los Angeles: J. Paul Getty Museum, 2009), p. 77, ill.